NOTE: – Plantar Fasciitis Relief in 7 Days is an instant access downloadable program that includes videos and manuals. 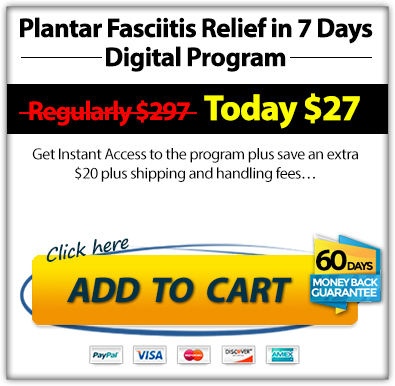 You can select and order physical DVDs of Plantar Fasciitis Relief in 7 Days. If you select to order the physical DVD and manual, they will be shipped to you in the mail. Note all other components of the program are only available in a digital form. You will get INSTANT ACCESS to download the videos and manuals. The manuals are in the format of adobe acrobat PDF, which can be viewed on Mac or PC. The video format is M4V which can be viewed on Mac, PC, computer, tablet or smartphone. Feel free to contact us via support(at)ExercisesForInjuries.com or (888) 291-2430. For the fastest assistance please include your order number, the email address you ordered with, your full name and the date of purchase. If you need to contact us by mail or return your physical order you can do so at: ExercisesForInjuries.com #2289 – 3151 Lakeshore Rd Kelowna, BC V1W 3S9 Canada.